In Psalm 12, David talks about a different kind of foundation: the Word of the Lord. He was frustrated with the people around him and felt alone in his faith. He was tired of lies. Tired of negativity and deceit. In his frustration he called out to God and noted the difference that he found in the Word of the Lord as compared to the words of man. they flatter with their lips but harbor deception in their hearts. It can be very hard when we feel like we are the only ones who care about honesty or matters of believing. As if we are the only ones concerned with honoring God and seeking to know Him more. All throughout Scripture we see believers who loved God but got weary and, like David, probably felt alone in faith. Noah was a righteous man who walked faithfully with God and was blameless, while the world around him did not and was not. (Genesis 6:9) He did the things the Lord asked him to do and did not win any popularity contests. 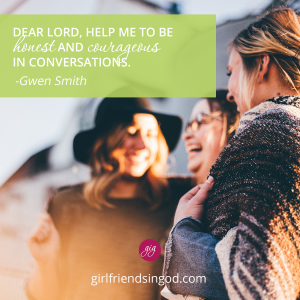 He was ostracized and ridiculed … and I imagine he had a few conversations with God that started a lot like David’s in Psalm 12. As frustrated as he was when he began his lament in Psalm 12 about the lack of faithfulness and honesty around him, David’s heart turned toward the positive as he contrasted the shifting faithlessness of man with the sturdy Word of God. I love that David spoke to God courageously about the brokenness of humanity, and I respect the way he discerned that it was important to transition his rant to righteousness. I want to be that honest and that positive. Though the people I interact with might not live with the same values as me, I should celebrate the gift of God’s Word that provides me with a firm and flawless foundation. A foundation that is complete and made perfect in Jesus. Jesus paid a high price to give you and me a firm and flawless foundation in the sight of God. He paid the highest price. So that all who turn to Him would be purified and refined in the crucible of His sacrifice on the cross. Look at that last line: the one who relies on it – the cornerstone, Jesus – will never be stricken with panic. Incredible. A reminder that when I find myself in a tizzy with anxiety, it means I’m standing on my own foundation of fear instead of the solid foundation of Christ. That’ll preach. I’m so grateful for this promise. Jesus is the perfect base for my faith. Would you join me in giving thanks to Him today for being our firm and flawless foundation? Lord Jesus, Thank You for the giving Your life so that I could stand firm in forgiveness, redemption and love. Please continue to refine and purify my heart today. Help me to be honest and courageous in my conversations with You and with others. Note that David did a few things: took his frustrations to God, asked God to respond, and celebrated the flawless foundation of the words of the Lord. Spend a few moments doing the same thing in prayer. Grab your journal and write a prayer of response, hash it out with Him on your knees, or post a prayer on the wall of my blog. Then pray through some of the other prayers posted! SPECIAL OFFER: If you need less panic and more promise in your life, and you want practical help, Gwen is offering a 20% OFF discount on the I Want It ALL book from her site when you use the coupon code: 20OFF. Click here to get yours now. Thank you that you are my firm foundation, this makes me feel so secure..
Everything may fail, but because Christ, the prince of peace and hope of glory is my all in all and lives in my heart, then I know I am more than enough. I know that i can count on you, even when everything else fails. I thank and bless you. Thank you for this App for my phone. I just downloaded today to be able to have a daily devotional everyday. I love that there are so many more things to see and watch and read with Girl friends in God. I want to grow closer in my walk with Jesus.